While many environmentalists quickly point out the adverse impact of the automobile — they quickly gloss over the environmental impact of near-empty light rail trains. The environmental impact of light rail, as a system, is considerably worse. The automobile takes passengers directly point-to-point (from origin to destination), but light rail requires supplemental trips to/from the station, whether via park-and-ride, kiss-and-ride, or bus. Let’s look a little closer at the DOLRT Environmental Impact Study. Buried on page 4-254, you will see two interesting tables (4.13-1 and 4.13-2). The first outlines Vehicle Miles Travelled or VMT which is a measure of how DOLRT is projected to impact traffic. Comparing the DOLRT projection with (build scenario) and without (no build scenario), the savings is less than -0.09% in traffic congestion (assuming that they hit projected ridership exstimates and Passenger Miles Travelled). If the projections are off, by say 10%, then DOLRT will actually have a negative effect and actually worsen traffic congestion. The second outlines annual energy consumption as measured by BTU (British Thermal Units). Comparing the projection with and without DOLRT, the savings is less than -0.06% in energy consumption. within the margin of error and not statistically significant. From a NEPA perspective, it is analytically problematic to conduct a project-level cumulative effects analysis of greenhouse gas emissions on a problem that is global in nature. It is technically unfeasible to accurately model how negligible increases or decreases of CO2 emissions at a project scale would add or subtract to the carbon emissions from around the world. Given the level of uncertainty involved, the results of such an analysis would not be likely to inform decision-making at the project level, while adding considerable administrative burdens to the NEPA process. The scope of any such analysis, with any results being purely speculative, goes far beyond the disclosure of impacts needed to make sound transportation decisions. Many environmentalists support rail-based transit for environmental reasons, but to date only BRT projects have been certified as greenhouse gas-reduction projects by the Clean Development Mechanism defined in the Kyoto Protocol (see Bogotá and Mexico City). Additionally, the volume of vehicle-specific emissions that LRT and electric trolley bus systems produce depends on how their electric power is generated. If the source is coal-fired power plants, then the system may actually produce more CO2 than normal diesel vehicles do, even though people are exposed to fewer emissions on the street. Buses are major producers of particulate emissions unless they use low-sulfur fuels, have particulate traps and clean engines, or run on some source of fuel that is an alternative to diesel. Using the overly optimistic 24,000 daily boardings projection (revised with NCCU extension in 2040) running 150 train trips per day across the end-to-end 17.7 mile line will result in an average ‘load factor’ of 10 passengers per vehicle mile traveled; or utilize 2% of the 500 passenger capacity heralded by GoTriangle. So for every one train that travels at the cited 500 passenger capacity, there will be ~50 trains running empty. Low capacity utilization is not environmentally or economically sound. From an energy intensity perspective, this low utilization has a devastating impact on DOLRT energy efficiency. With an average of 10 passengers per mile results in 6327 BTU per DOLRT passenger mile (63265 BTU per vehicle mile / 10 passengers per mile) compared to 3144 BTU for car travel or 4071 BTU for bus transit. So per passenger mile, DOLRT uses over twice the amount of energy of an average car! Due to the limited coverage of light rail stations, light rail requires altered bus routes to “feed the beast”. These feeders add cost, consume more energy, increase travel distance and increase travel times, while compounding the traffic congestion they are supposedly trying to alleviate. The light rail system is forced to provide an entire, high-capacity vehicle even when there are only a few riders. The inconvenient truth is that not a single light rail in the US carries as many passengers as a single highway lane. The myriad of alternatives, like walking, bicycling, carpooling, van-pooling, congestion pricing, telecommuting, flexible working hours, parking reform, pricing strategies to improve bus utilization, etc — largely ignored while the money and attention is consumed by light rail. The proposed Durham-Orange Light Rail train has NO new renewable energy requirement and electricity sourced from Duke Energy which has been repeatedly cited for environmental transgressions. Duke Energy generates electricity primarily with nuclear, gas (sourced from ‘fracking’) and coal power plants. The Political Economy Research Institute ranks Duke Energy 13th among corporations emitting airborne pollutants in the United States. The ranking is based on the quantity (80 million pounds in 2005) and toxicity of the emissions. When the high energy costs and carbon emissions during construction are counted, the light-rail line is far “browner” than autos and highways. Forgetting greenhouse effects during construction? Neglecting to take into account the emissions associated with constructing buildings like train stations and laying the tracks may make train travel appear far more environmentally friendly than it actually is, the authors found. “Most current decision-making relies on analysis at the tailpipe, ignoring vehicle production, infrastructure provision, and fuel production required for support,” wrote the authors. “We find that total life-cycle energy inputs and greenhouse gas emissions contribute an additional 63 percent for on road, 155 percent for rail, and 31 percent for air systems,” relative to those vehicles’ tailpipe emissions. — How Green is Rail Travel? 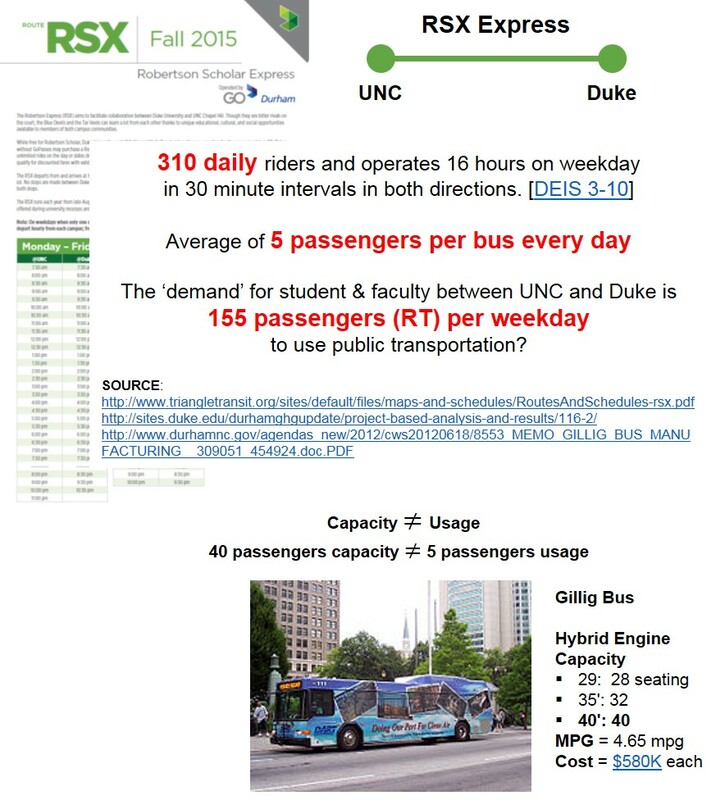 This entry was posted in myth and tagged Bias, BRT, BTU, Bus, Capacity, Chapel Hill, Charlotte, CO2, Commute, Daily Boardings, DOLRT, Duke, Durham, Efficient, Energy, Environment, GoTriangle, Greenhouse, KwH, MPG, RSX, UNC on August 28, 2015 by admin.